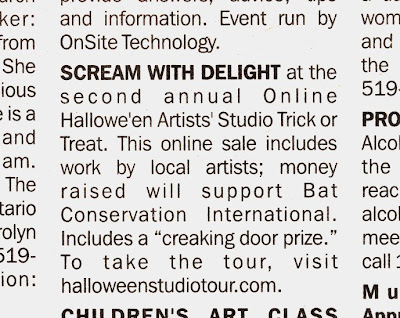 Hallowe'en Artists' Studio Trick or Treat Tour: We're out there! Our tour is in my local paper! In the "What's On" section of the October 8th issue, here's our advertisement! Wow! Looks great and the editor did a great job! Thanks so much! If you want to help us out, see if your local paper will run a similar ad! We'd really appreciate it! So would the bats!